I have a peterson with a horizontal crack in the bowl. I got this off eBay for under $10.00 with the intentions of trying to restore it. I was planning on trying some super glue to fill the crack on the outside of the bowl, and Pipe cement (see sticky above) inside the bowl.Then refinishing the wood to cover up the repair. Will this work? Are there any other ideas on a fix? First take a hammer...oh wait you said repair. Sounds like a stable attempt i would say try wedging the crack to clean it real good before hand and then after applying the glue find a way to clamp it down to help it hold better. Pipe cement may help but remember it expands and contracts also and it may wind up recracking the repair. Hey Rick,show him what you did to that Lorenzo. I dont have a picture. Ill take a few this evening after work for show and tell. The crack is tight and cant be wedged open but cracked enough that a drop of rum can fins its way through. 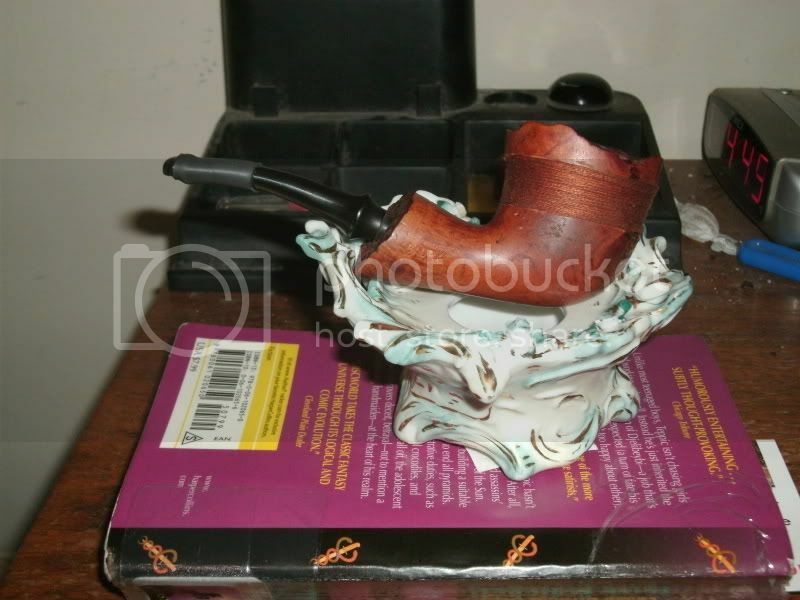 Place pipe bowl securly on large block of wood (any type will do). Raise splitting axe far above head, bring it down forcefully on top of pipe bowl. Problem solved. I used wood filler on cracked bowls before and worked fine. It was cracked on both sides about 3/4 of the length of the pipe so I spread the cracks just a bit super glued them and used a cat collar to keep tension on it while the glue set. Then I took a thin belt form one of my sanders and recessed a 1/2 inch strip all the way around the pipe. My wife took the pipe down to the fabric store and chose a dcm floss that matched pretty close. I wound it nice and tight and glued the end down. It has been smoking nicely for over a month now and I make sure it has been getting used at least 3 or 4 times a week. Just try not to get any glue inside the bowl or you have to sand it out. You may call me "HerrDoctor"
Thanks for the advise guys. I cant see your picture. I think my work computer is blocking it. hey, to make things simple here, i would send it off to a pipe repairmen. such as tim west. he can fill that area of burnt wood with no problem the crack that is. the crack can be filled with no problems. good luck too you sir.